Aaqil Ahmed served as BBC Head of Religion and Ethics from 2009 to 2016. He’s an outstanding speaker in public debate on leading subjects of ethical and policy interest. 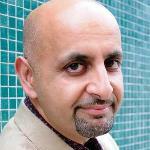 Aaqil Ahmed grew up in up in the north of England and is a practising Muslim. From 2000 to 2003 he was Deputy Editor of Documentaries in the BBC’s Religion and Ethics department before heading up Channel 4’s religion and multicultural programming. His high-profile TV projects include Panorama, Everyman and BBC news specials such as The funeral of Diana, Princess of Wales. He is also responsible for award winning programmes such as Saving Africa’s Witch Children, The Qur’an, Inside The Mind Of A Suicide Bomber, and Christianity: A History. In 2005 he was voted No 4 on the list of The 20 Most Powerful Asians in Britain. Since 2010 Aaqil has helped bring about highly praised productions including Ottomans: Europe’s Muslim Emperors, The Life of Muhammad, Hitler’s Children, and the acclaimed Melvyn Bragg documentary on the 400th anniversary of the King James’ Bible. He has been responsible for the UK’s leading religious programme Songs of Praise as well as the BBC’s coverage of Pope Benedict XVI’s visit to the UK in 2010. He is a Professor at the School of Media and Performing Arts, Middlesex University and has served as a trustee of the Runnymede Trust and Prince Charles mentoring charity, Mosaic. Aaqil Ahmed is a superb communicator and opinion-leader on the most challenging moral and religious questions of our times. He also has ideas about the future of public service broadcasting, diversity and the role of broadcasting in the Internet age. His insights on these issues and on the professional disciplines needed to make compelling programmes about them are bold and thought-provoking.